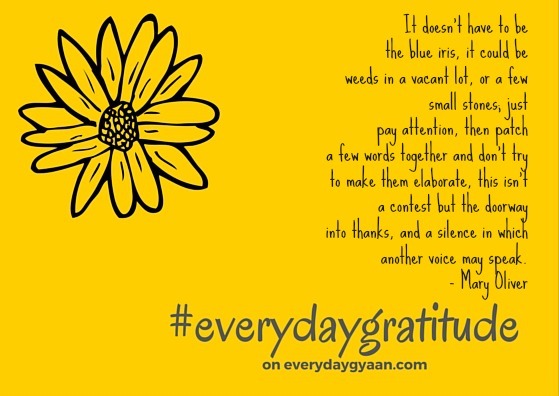 Everyday Gratitude is a new feature on Everyday Gyaan – a post on gratitude that will appear here every 2nd Saturday of the month. That we need to practice it every day. Each of us need to find our own way of practicing gratitude- use a notebook, keep a small document, write a blog post, set aside a short time every day to think about all you are grateful for. That we find things to be grateful for in the ordinary, everyday circumstances of our lives. Nothing spectacular. No fancy words. No contest. I find that I’m offering gratitude in the unlikeliest of places and circumstances. If you’re looking for a linky, you’ll find the monthly Gratitude Circle on Vidya Sury’s blog, Today’s Gratitude List on Laurel Regan’s blog and Ten Things of Thankful on Lizzi Rogers’ blog. You’re welcome to share your list of gratitudes in the comments here. If you share your gratitude posts in the comments and on Twitter with the hashtag #everydaygratitude, I promise to share your posts on social media. Corinne, My February 2016 gratitude list – Gift Your Children With Gratitude ….. Thank you so much, Corrine, for linking with the TToT. I do the same as you for the shower, for water, for food…we’re so blessed. Acknowledging it is humbling and helps a lot. My pleasure, Lizzi. I wish I could commit to a weekly TToT post. I feel guilty when I can’t visit all the blogs linked in. We truly are blessed. And one of my blessings is being connected to you!